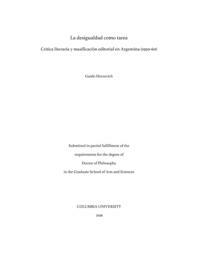 In this dissertation, I argue that the shifts in the terrain of literary criticism in Argentina during the 1950s represent the development of what I call a “critical infrastructure,” whereby criticism came to perform an essential function for the circulation and appropriation of books and literature in a context of major transformations in book publishing and distribution. In doing so, I bring together two phenomena that belong to a single historical shift, which saw the expansion of mass cultural production, and the consequent development of material and discursive practices to distribute them and to allow them to be appropriated. On the one hand, Buenos Aires experienced a rapid expansion in its publishing industry as a consequence of the Civil War’s ravages on Spain, turning Argentina for a brief period into the world’s primary producer and exporter of Spanish language publications. On the other hand, Argentina experienced what is frequently referred to as an “eruption” in literary criticism in the 1950s, propelled by the proliferation of a number of small, independent literary journals headed by young, middle-class writers and critics. These publications represented a critical challenge to the Argentine literary establishment, which was hitherto almost exclusively comprised of intellectuals belonging to the nation’s elite. While there has been considerable academic interest in each of these phenomena, theorizing their relationship to one another offers important insights into the reasons for the increased relevance and visibility of these otherwise marginal publications. Analyzing a variety of heterogeneous periodicals (including major newspapers like La Nación and La Prensa, as well as “little magazines” such as Espiga, Centro, Bibliograma, and Contorno), I discuss the expansion and increasing contentiousness of literary criticism, which became an ever more regular and visible presence in such publications. I trace the transformations in publishing (1899-1953) to show how a process of indifferentiation among printed materials made the intervention of discursive practices —mainly performed by literary reviews— a structural necessity for the distribution and appropriation of books and literature. Drawing from Adolfo Prieto’s seminal Sociología del público argentino (1956) as well as other texts, I discuss the ways in which the presence of a mass public with ostensively heterogenous ways of “consuming” literature posed a challenged to traditional ideas about national literature, the act of reading, the “figure” of the reader, and consequently also about the nature and function of criticism. Finally, I analyze the small avant-garde magazine Letra y Línea (1953-54) to show the empowering effect this transformation had on relatively marginal, middle-class writers, who invested themselves in a radical critical task in order to seize the opportunity offered by this structural discursive need.